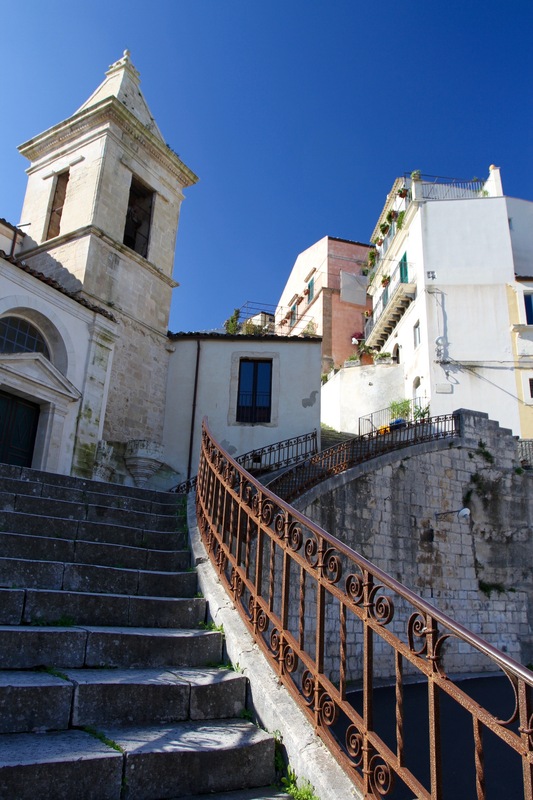 To reach either half of Ragusa, the old town of Ragusa Ibla and its newer counterpart Ragusa Superiore, requires you to descend into the deep ravine of Valle dei Ponti, and then clamber back up endless flights of steep stairs worn by the passage of time and countless feet. There is no better example of this than the Salita Commendatore, stairs that wind through the 18th century heart of Ragusa Superiore, crossing hairpin bends of the winding road and passing under stone arches as you climb. Breathlessly, we arrived at the Chiesa di Santa Maria delle Scale, St Mary of the Stairs, a 13th-century Gothic church given a Baroque makeover after the earthquake of 1693 which flattened much of the original city. The climb to the church is worth the effort when you turn around. I challenge anyone not to be wowed by the superb views across to Ragusa Ibla and over the surrounding countryside. 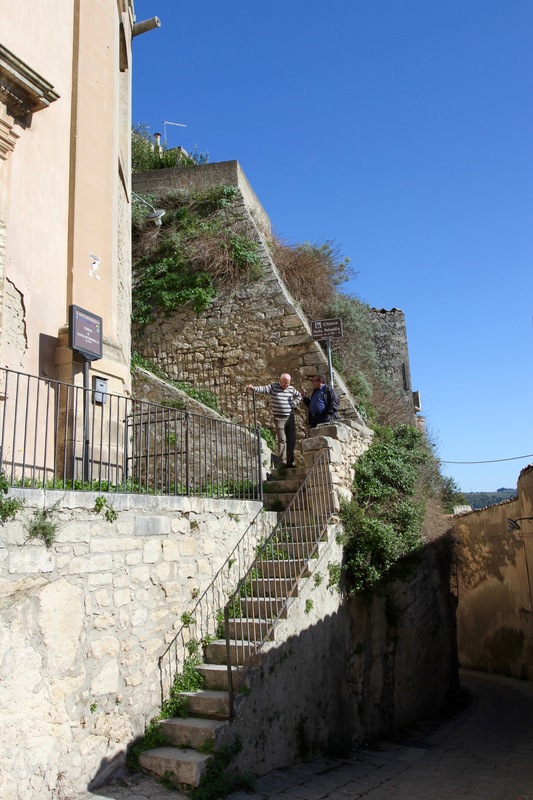 Once you reach the small square next to the church, the good news is that it’s all downhill back to Ragusa Ibla. Like too many churches on our trip, St. Mary of the Stairs wasn’t open. 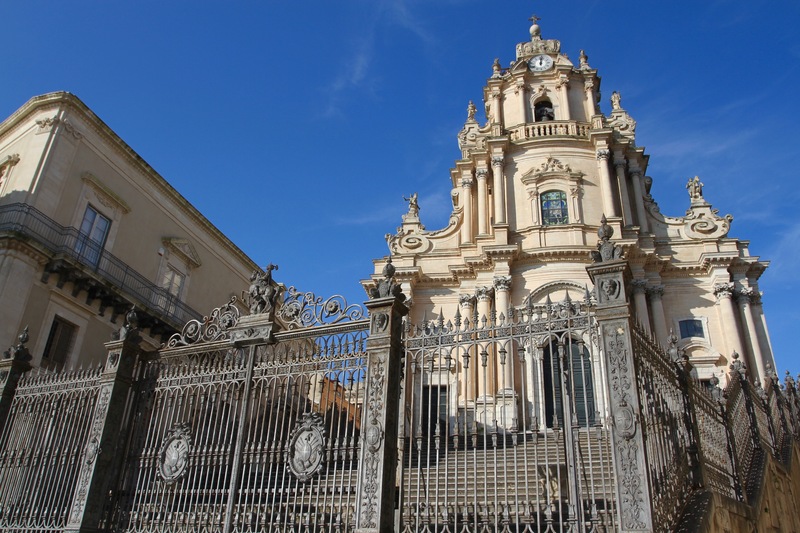 You have to time your visit well to arrive when churches are open in Sicily, even the cathedral in Ragusa only opens for limited periods. 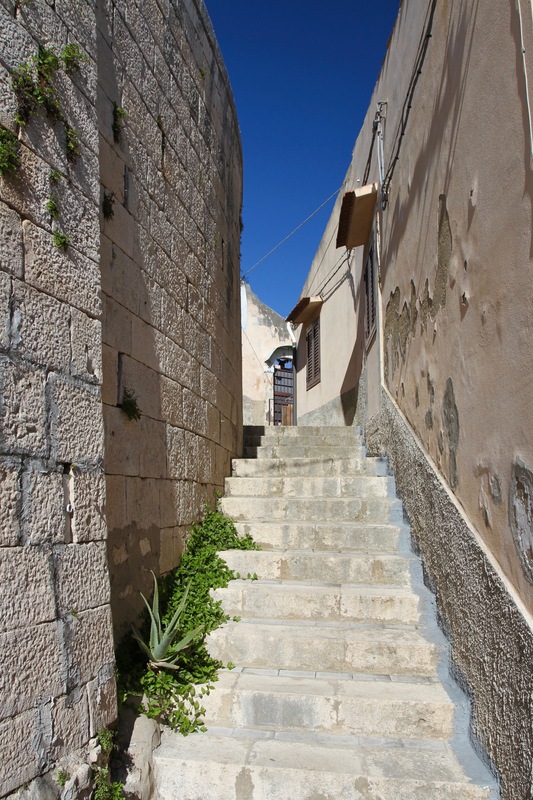 We started our descent on the road, but occasionally dived down narrow stairways or cobbled alleys to explore the nooks and crannies of this fascinating place. 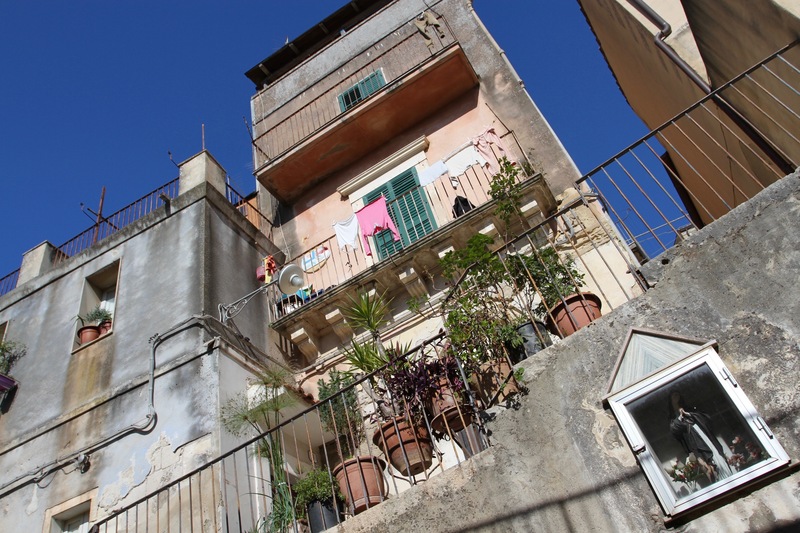 There are tremendous views to be had between the tall houses as you tumble downwards to reach the Church of Santa Lucia. 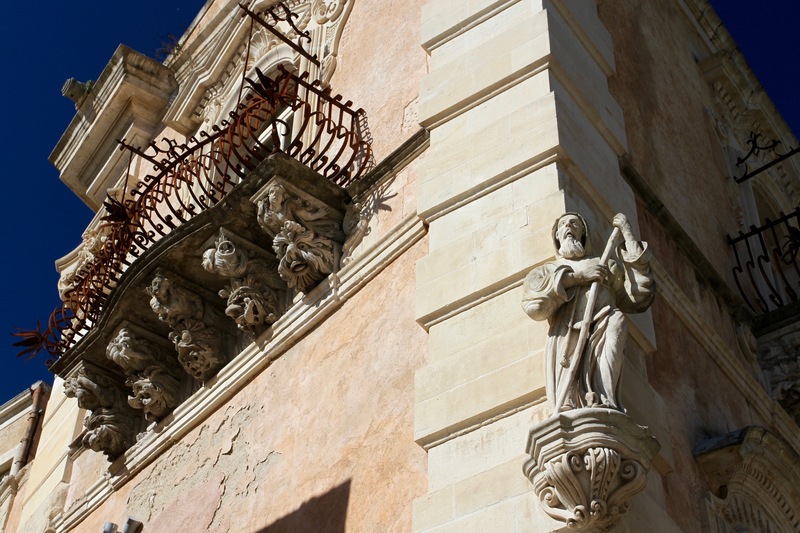 The small square in front of the church offers panoramic views, some of the most iconic in Ragusa. The blue dome of the Church of Santa Maria dell’ Itria prominent against the cityscape. 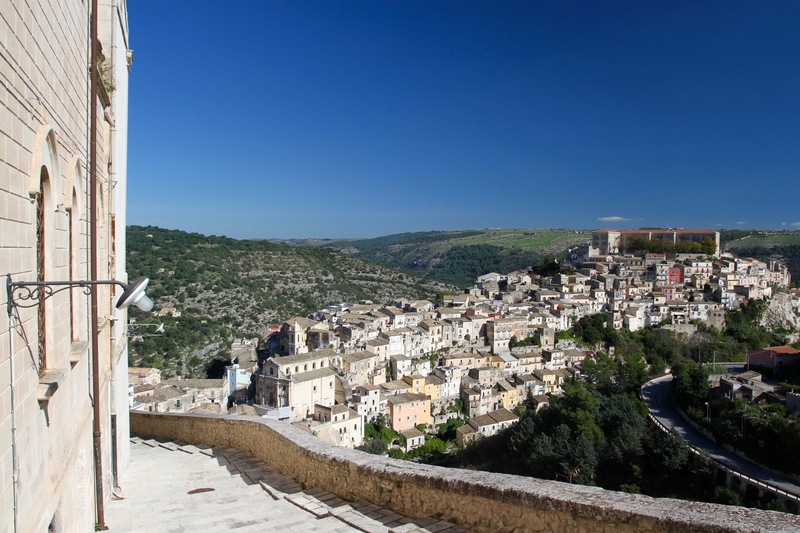 From this vantage point you get a sense of Ragusa Ibla’s layout and its place in the landscape. We spotted metallic figures of people climbing a nearby hill, a nod to a local legend that claims the treasures of the town were buried on a hilltop to stop them falling into the hands of the invading Arabs. Treasures that have yet to be found. 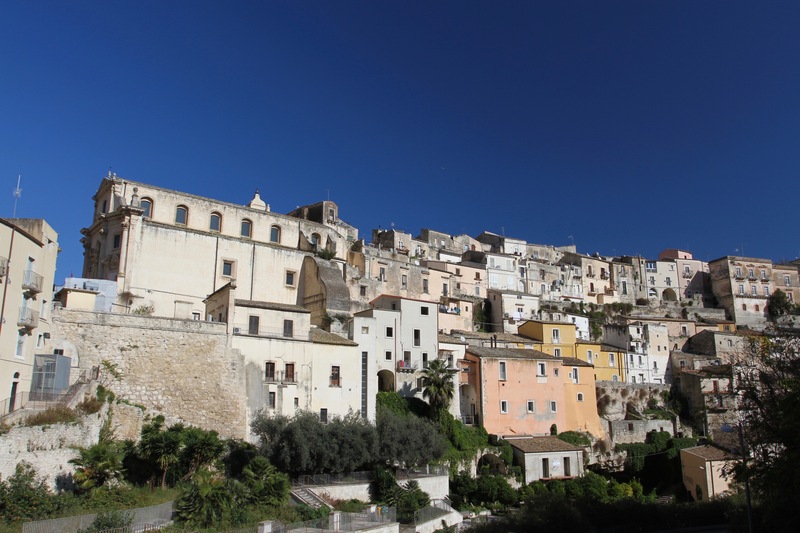 This part of Ragusa Superiore was built following the 1693 earthquake that destroyed the ancient town of Ragusa Ibla. The devastation was almost total and a decision was taken to build a new town on the hill opposite the original town. 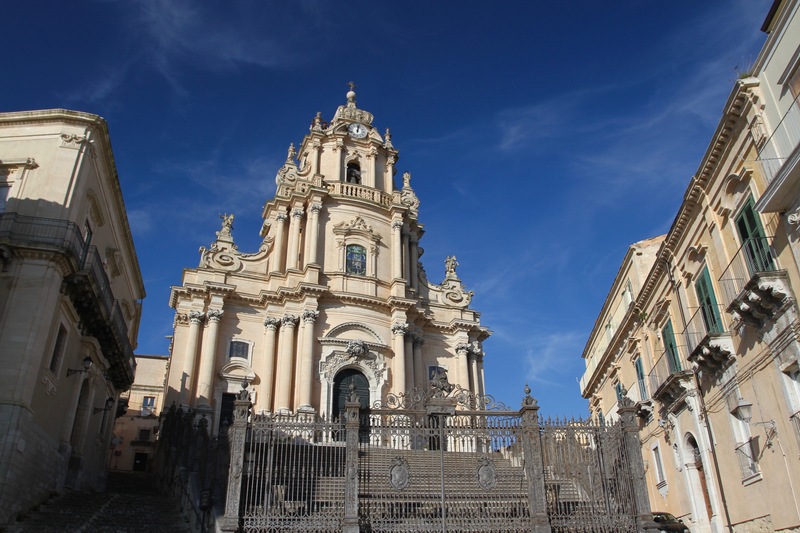 A new cathedral and grand palaces were built, and that might have been the end for Ragusa Ibla, except the local aristocracy couldn’t bear to see the town fall into ruin. 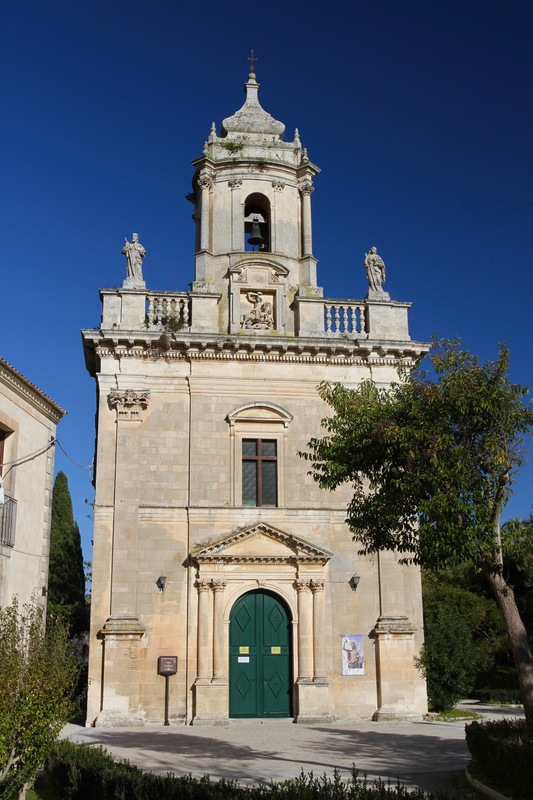 Instead, they decided to rebuild their former palaces, churches and houses in the Baroque style. 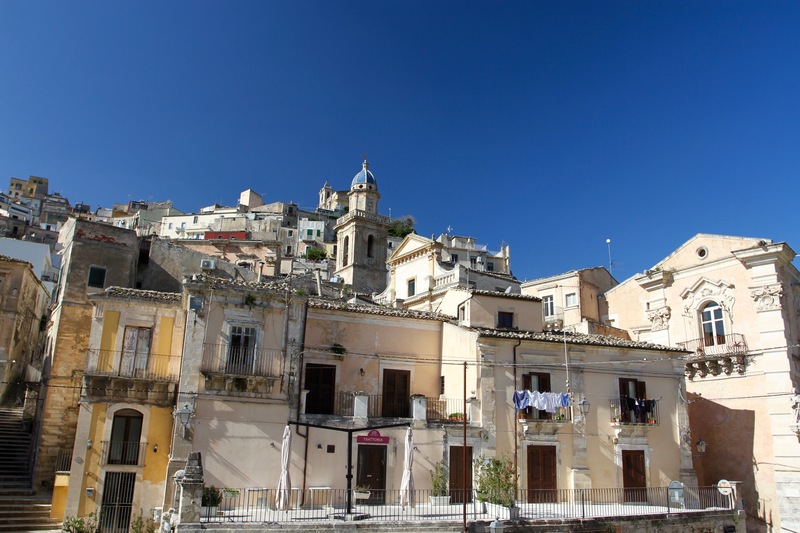 Ragusa Ibla dates back to the Ancient Greeks, and was a thriving urban centre during Roman and Byzantine times. 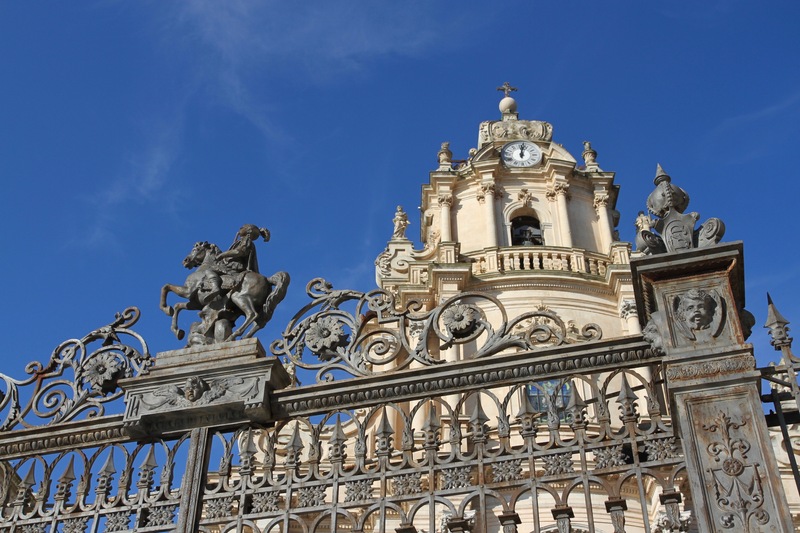 It continued to be an important economic hub during the 200-years of Arab occupation before the 11th century conquest by the Normans, after which it was a provincial capital in the Kingdom of Sicily. This epic history can still be glimpsed as you wander the streets of Ibla, or more conveniently in the archeological museum. 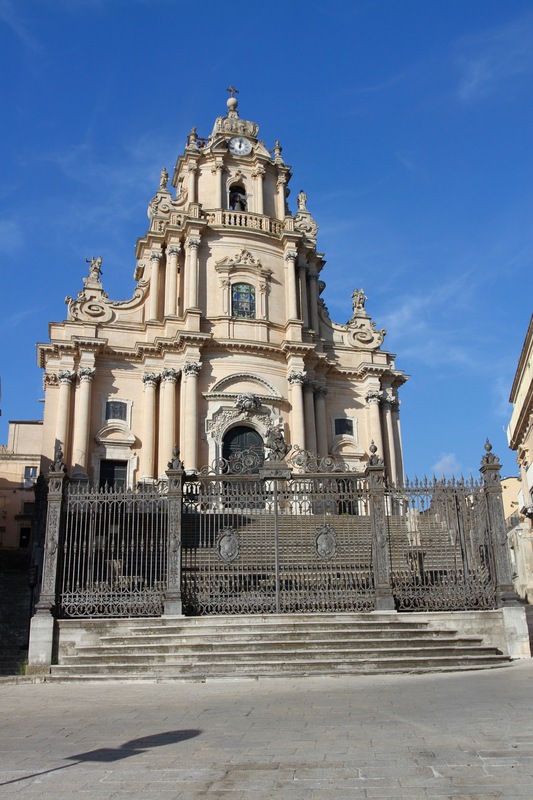 We made our way back into Ragusa Ibla, and wound our way around the streets to the Piazza Duomo and then to the scenic public gardens at the bottom of the town. 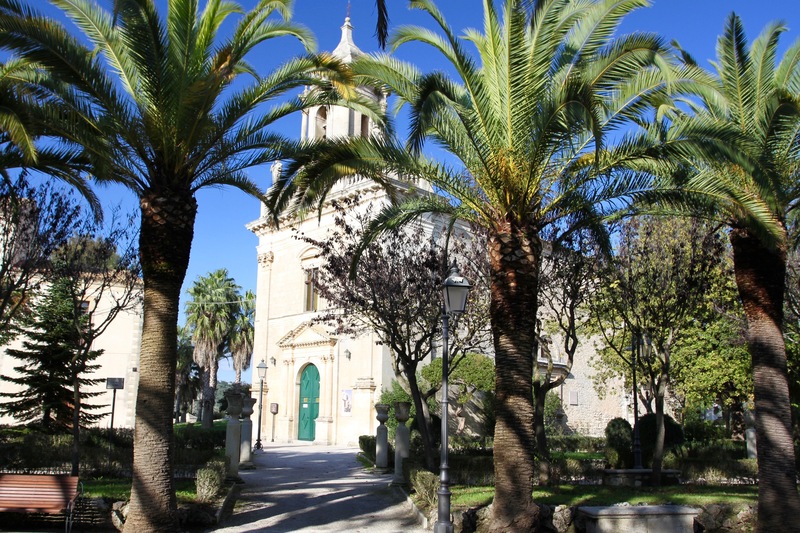 The gardens have a lovely avenue of palm trees, three attractive churches (none of which was open), and, best of all, sweeping views across the countryside. We sat on a bench in the shade and watched the world not go by, before heading back into the maze of Ibla. Unbeknown to us, we had timed things well because all the churches suddenly seemed to be open … finally. Our first sight of Ragusa Ibla, the ancient heart of a town that is split in two halves, was breathtaking. The spectacular collection of tightly packed houses, churches and 17th century palaces cling impossibly to the sides of a steep hill. The baroque architecture, bathed in the early morning sunlight, is a magnificent sight. 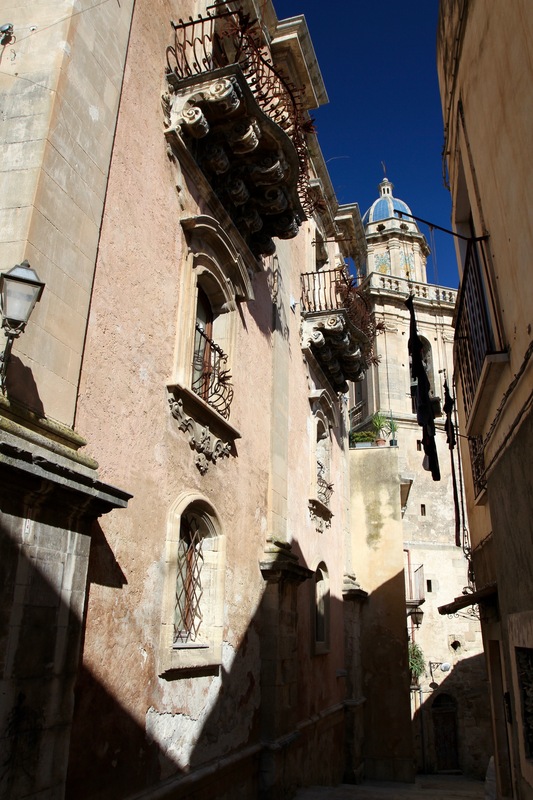 If there’s one thing the old town of Ragusa doesn’t lack, it’s a dramatic location. This extends to the hairpin bends of the road that plunges into the deep valley below, where the town’s car park is found. This first sight of Ragusa is seared into my memory, yet in twenty-years time it isn’t the thing that I’ll most remember about the town. 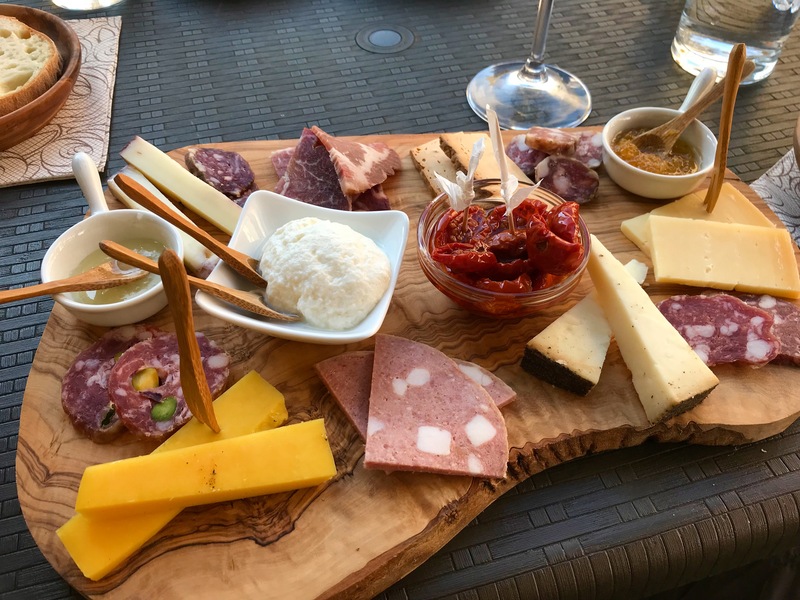 No, that accolade goes to the donkey salami we were served along with a glass of local white wine while we sat admiring the exquisite Cathedral of San Giorgio. Please don’t ask what it tasted like, I’m still trying to forget that I ate burro. Donkey features regularly on the menus of Ragusa, I drew the line at one restaurant which was serving a daily special of roasted donkey ribs. 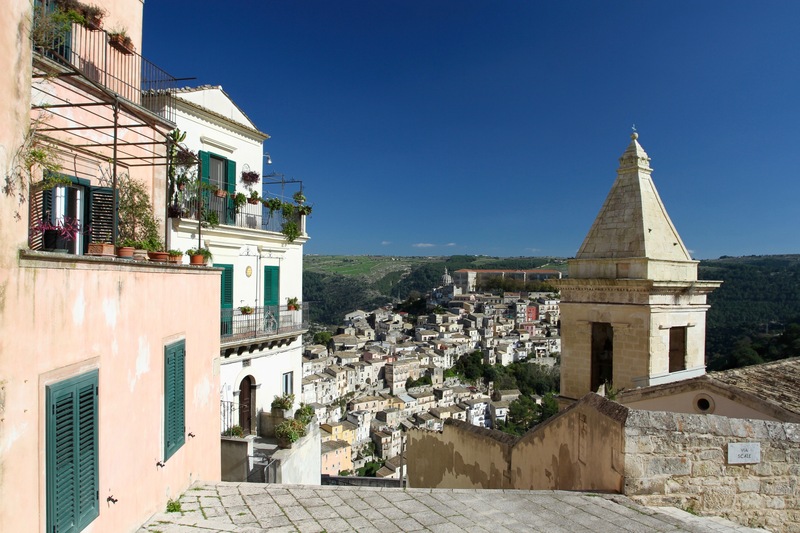 Ragusa has an outstanding collection of restaurants, ranging from the Michelin-starred Duomo Ristorante to the more humble Enoteca Il Barocco, which is a wine shop with a good line in platters of local cheeses, meats and pickles. I would go as far as to say that Ragusa is worth visiting just to sample some of its restaurants. The €190 tasting menu at Duomo Ristorante was a bit pricey, but the chef has a second restaurant, I Banchi, which doesn’t require such deep pockets. The prize for ‘best pizza of the holiday’ goes to Ragusa’s Ristorante ll Barocco. Delicious. 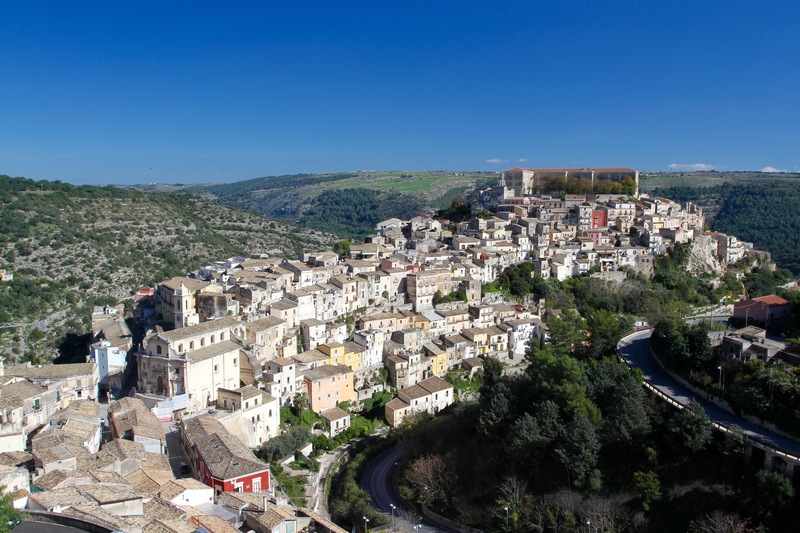 We arrived in Ragusa Ibla after driving through the workaday modern town of Ragusa Superiore, which involved daredevil driving during Sicilian rush hour and a reasonable amount of ‘course correction’. 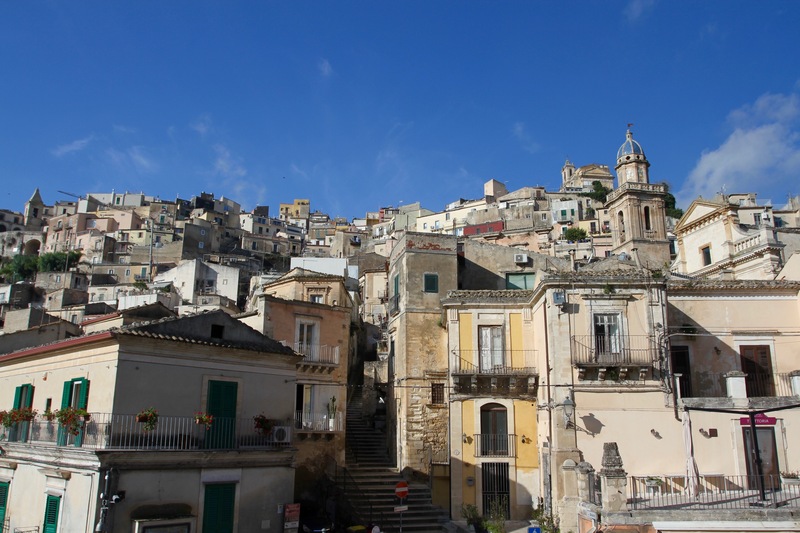 This is a town of two halves, and after the dreary streets of Ragusa Superiore the sight of Ragusa Ibla, crowned by the dome of the Duomo di San Giorgio and the massive Universitario Della Provincia Di Ragusa, was special. 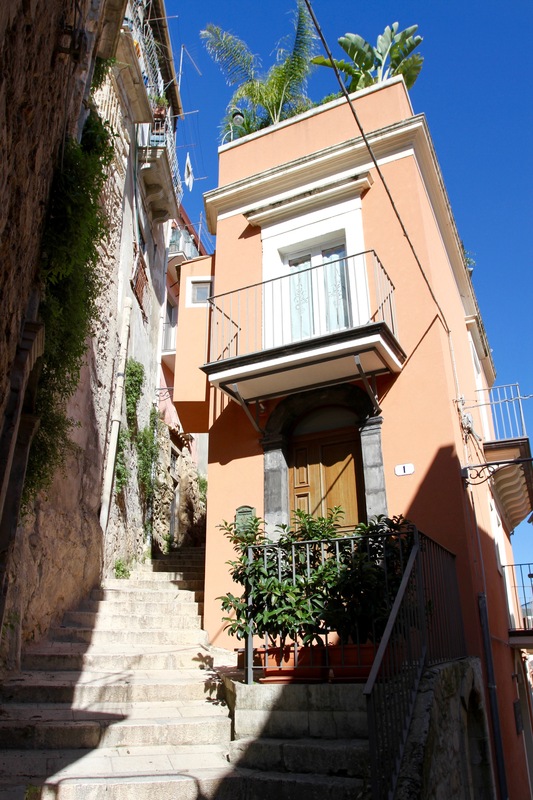 Our next task was to locate our B&B amongst the maze of streets and steep stairways. 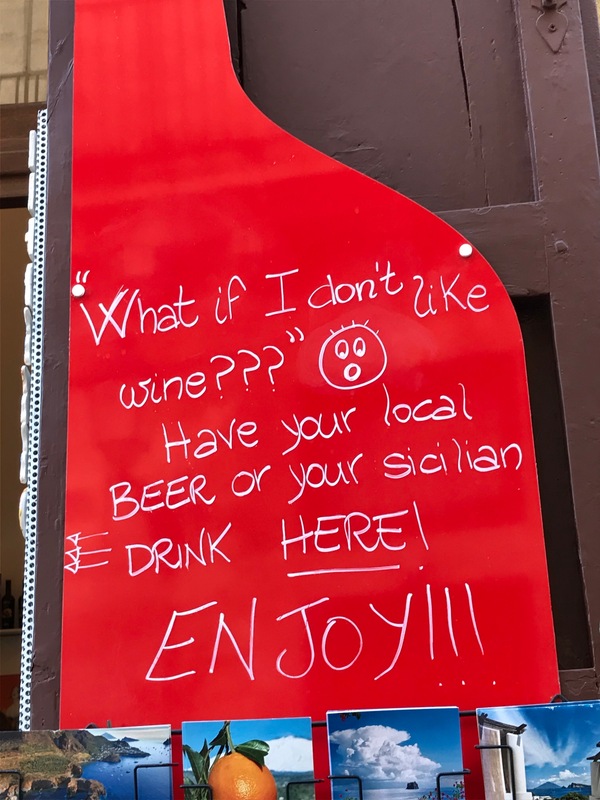 No one who isn’t Sicilian would ever want to try to drive in the streets of Ragusa Ibla, it is a terrifying prospect. 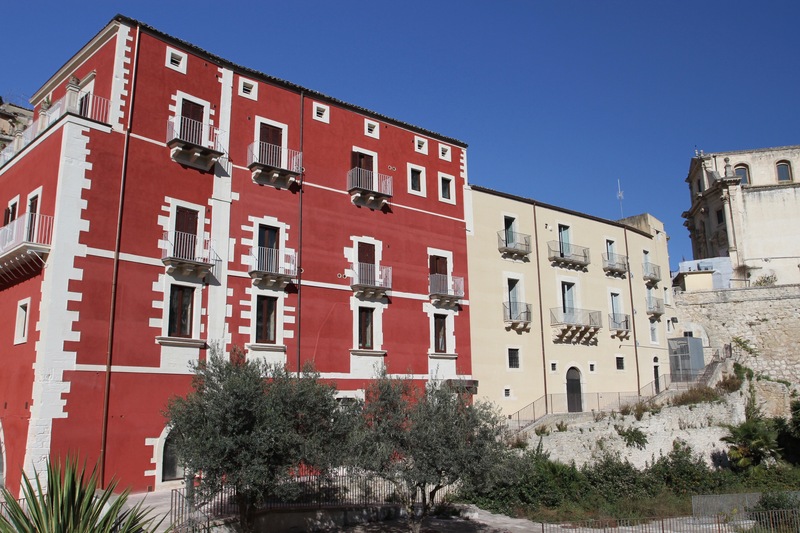 So we abandoned our hire car in the municipal car park and set off to search out the Giardino Di Pietra, our B&B in a restored 18th century house run by the most recent generation of an old Ragusa family. We found it with relative ease, and had the delight of being driven back down to the car park in the owner’s tiny 1948 Fiat 500 to collect our bags. I don’t typically make recommendations on this blog, but Giardino Di Pietra is so good it deserves a mention. 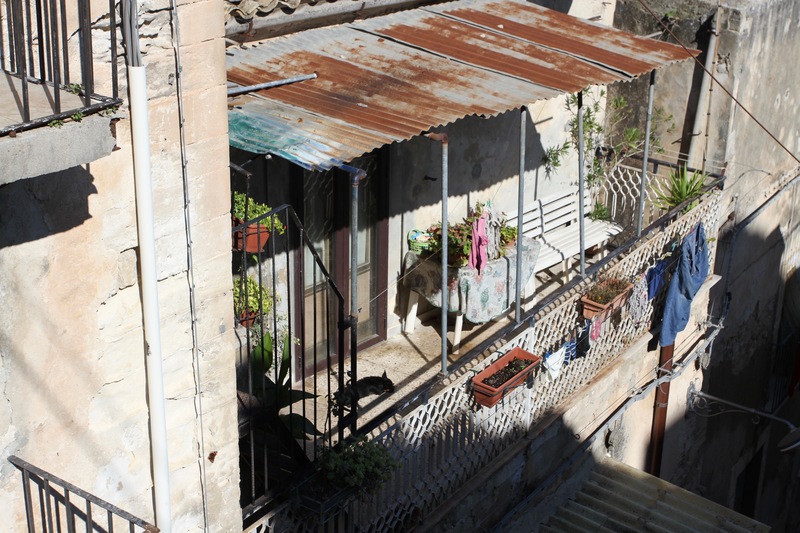 Our room at the top of the house had fantastic views over the tiled roofs of the town towards the 18th century part of Ragusa Superiore, and was furnished with original art nouveau furniture. Better still, the breakfast of homemade jams and other local delicacies was the best of our trip. Elena, who runs the place, was fabulous. Infomercial ends. Map in hand, we headed into the warren of streets to find lunch. A little like the Grand Old Duke of York of nursery rhyme fame, we marched up to the top of the hill, and then marched back down again, went around and around for a while, before eventually, and unexpectedly, landing in the Piazza Duomo, dominated by the magnificent cathedral and surrounded by baroque buildings. We didn’t know it at the time, but this would be our first (and possibly last) encounter with donkey-based delicacies. 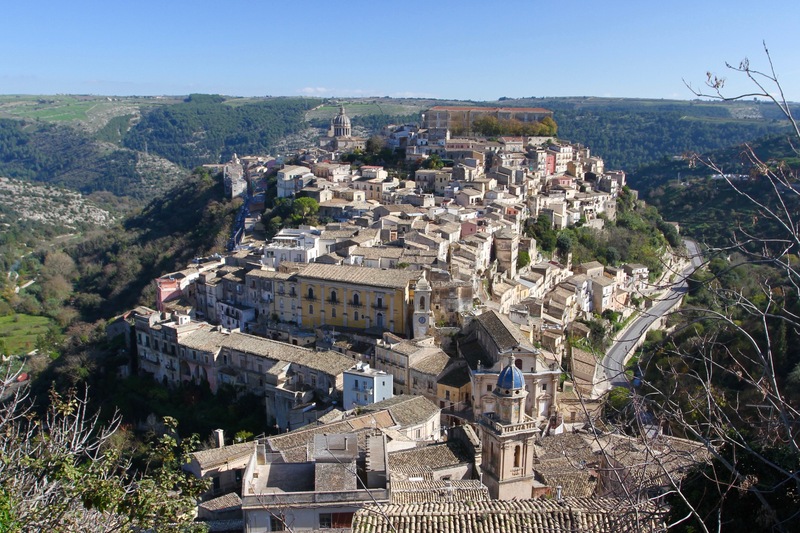 The exploration of the rest of Ragusa would have to wait for the afternoon.